An action-packed biography of one of the world's most famous daredevils, portrayed by George Hamilton. Many of the wild stunts in the film were performed by Evel Knievel himself. In the moments preceding a particularly difficult jump, motorcycle daredevil Evel Knievel reflects back on the events of a lifetime. 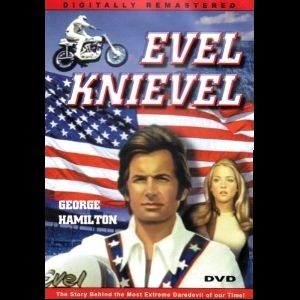 Starring George Hamilton (who also produces), Evel Knievel sets out to establish the motivations and circumstances that led him to become a legend and inspiration to a whole new generation of extreme sports enthusiasts, including his own son - Robbie. Filmed in Evel Knievel's real life home town of Butte, Montana, the film also costars Sue Lyon and Vic Tayback, who help add back-story and depth to this enigmatic character.